10:20 – A sponsor can pay anywhere between $50 – $75 per 1,000 views. 14:40 – Lane’s lighting tips; Stay near a window or turn on every light that’s in front of you, but not the ones that are behind you. 16:00 – He doesn’t film videos on iPhones often because it’s too shaky and because of hard drive space issues. 17:30 – YouTube.com is a major player, because it’s owned by Google. “You can do a collaboration with other YouTubers where you are in each others videos, you swap videos and can edit together.“ Tweet this! “I do pretty much everything I do with a little Canon Power Shot camera that shoots HD video.” Tweet this! “Video Lighting Tips – Turn on every light in the room that’s not behind me, because you don’t want to be back lit.” Tweet this! 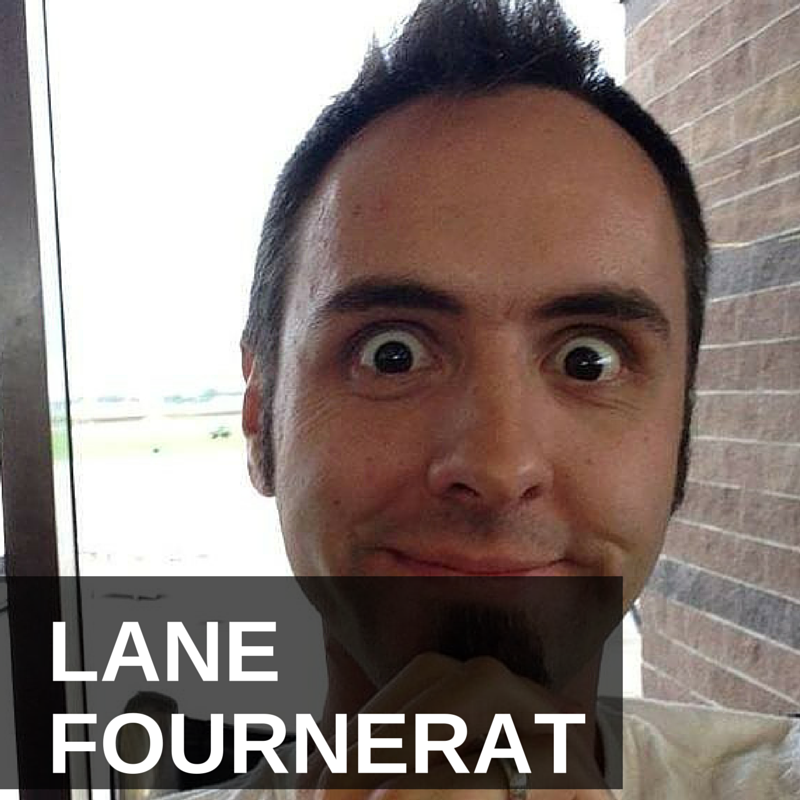 It’s my pleasure to welcome Lane Fournerat to the show. Here is a video and YouTube marketing expert and he’s going to share some great insights with us today and how we can do better at video. I must confuss as we were talking pre-show here I admitted to him that we’re just not very good at video. We’re good at audio. We’ve been doing audio for 7 years now and podcasting and that’s to listeners like you and telling your friends all of my different shows. We do great at that, but really want to strength our video component. It’s such a powerful medium. It’s my pleasure to welcome Lane to teach us all more about that today. Lane, how are you? Oh my great, thank you for having me on. This is going to be fun. The pleasure is all mine. Where are you located? Give our listeners a sense of geography. I’m in Louisiana. South central Louisiana. Fantastic. Well, the food is great there and I guess the videos are pretty good too, right? Yes, they are. Absolutely, because I’m here! Tell us how you got started and teach us about video marketing, what can we really learn and do to be more successful at it? First let me get started with how I got into this, whenever I was young I was always interested in being a performer. At age 11 I was on the theater stage. It wasn’t until 2002 that I actually got a camera and some editing software and half way through college I realized that I liked doing that over some of the..I was doing performing arts at the time, so being in front of the stage on a theater. After I graduated college, I started putting together some short films and I was going to send them out to festivals and all that. My wife and I got married. We moved to Tulsa, Oklahoma for a little while to be with her family and then while I was up there I found this girl named iJustine on YouTube. It looked like she was making money at making short videos online. I was like, “Wow, that’s exactly what I wanted to do. If she can do it, I can do it, right?” I kind of delved all in on what she was doing online. I kind of saw some of the connections she was making with other people in the YouTube area and I didn’t realize this at the time, but as I’ve grown my brand on YouTube, I realized I need to connect with other people. There’s definitely a social gain that’s played there, to be able to reach out and shoot videos or do collaborations with other people out there. It seems like that’s where you grow and gain strength as a brand on YouTube, at least for me I’ll say. Tell me what you mean about the social component though, you mean just networking with other YouTube channel hosts? Right, exactly. You wanna, first obviously you’re going to start off as a viewer for them, but using social media sites like Twitter, maybe Facebook, or something like that, you can reach out to them in ways you wouldn’t be able to before those services were there. Once you start doing some of that, you can hopefully do a collaboration with one of them, where you kind of be in each other videos, you swap videos and edit together where it looks like ya’ll together. That type of thing. Hopefully, the person you collab-ed with will want to give you some kind of, ‘Go subscribe to this guy on his channel’, some kind of push to where you can grow your brand a little bit more. With audio that’s so easy, but with video it’s a lot more difficult. I mean, this is one of the reasons why we really haven’t adopted video as the major medium. I will tell you Lane, as a consumer, I certainly know people are watching videos in a big way. I know they’re very powerful. I know people on YouTube are creating great businesses and just making tons of money, but as consumer I love the portability of audio. That’s just my consumer side, but as a producer, how do you get in each other videos? What do you do? Sit at your desk and you say something and then they sit at their desk and say something or using Fuze or just Skype? What’s the best practice there? Sure, I’ve seen all those done actually. I’ve done interviews where they’ve wanted to do a video call through Skype and they use that as video on their YouTube channel or if you’re doing a short video type of thing and there’s a phone call scene, you can be on the phone and you’re just cutting in between the conversation there and get it going that way. There are conferences out in LA and Orlando that are YouTube centric. Creators meet up at these conferences and kind of shoot as many collaborative videos as you can while also going to the panels and doing everything else associated with the conference. Well, I’ve turned that into a collaboration by getting other people to sending clips of their kids trying to say words and they put my daughter on their channel and they say, “Oh, we’re going to pay this fun little game with Lane over at his channel. Try and guess what she’s saying!” We swamp clips that way and hopefully it leads to more people to my channel and I can send some people to their channel just to play this little game through video. So where’s the revenue? Is it in the business or is it strictly in YouTube advertising? It’s probably a mix. You first are going to start YouTube advertising once you become a partner with YouTube, which I believe nowadays is fairly easy to do. You basically connect your ad-sense accounts. Back a few years ago you had to go through a program and fill out a form and all this type of things, nowadays it’s easy. You can turn on your ad-sense on your videos and you can start making ad revenue the day it goes live. It seems there where most of the money is made in YouTube is one of two ways. One, you do brand deals with bigger brands and companies out there to basically sponsor a video. Basically you kind of shout out whatever product they have or you do a video centered around the product that they have and hopefully you can drive some traffic to them, because that’s what they would like. The second way is through some kind of merchandising, which I’ve seen run the gamut to doing their own films to making a video game or an iPhone app or an iPhone game to, you know, socks, shirts, hats, the whole merchandising gamut that you can go down, but from what I can tell, that’s where the money is made in this game. Tell us about some of your stats if you would. *Laughter*. Reminds me of will it blend. Yes! Very much in that vain. Don’t have an explosion or anything! Right, right. I did this video on how to make a home-made lava lamp and it’s real simple. You take a 2 liter bottle, you put some water on the bottom, some oil on the top, and you put an Alka Seltzer in it. The Alka Seltzer falls down and the thing bubbles up through the oil and it gives a lava lamp look. You can put a light underneath it if you want to. The video sat dormant for, gosh, probably 6 months to a year, just barely trickling by, and then last summer I noticed that just started sky rocketing. To this day, it just reached over 3 million views. That’s an incredible thing to happen to me, I have no clue how it happened and I wish that I could duplicate, and that’s probably why I hate the video so much. Wow, that’s just amazing. I mean, what amazing numbers. Do you have any numbers on like what that video actually did for you? Talk to us about revenue and maybe just the advertising side if you want, but maybe the bigger picture, it’s up to you, but just give us a little insight into that. Well, I can let you know that on YouTube’s terms of service, us as creatives are not allowed to talk about how much we make through YouTube’s ad-sense model. I wish.. Yes. I know. I wish I could tell you guys more, but I can’t. I will tell you this, I was at a conference called Playlist Live this past march and they were saying whatever you’re doing a sponsorship type of deal, for every 1,000 views that you can get to your video, a sponsor should be willing to pay you around $50 to $75 per 1,000 views, just to give you what an in-video sponsorship type of revenue is out there. Explain what that is. Is that a pre-roll? How long is it? Is it 15 seconds? Is it video and audio or is it just a little message that comes up on the video as the video is playing? I’ve actually done a video with Baby Magic. They make baby lotions and body wash type of things. I did a video called, “7 Celebrity Hairstyles with a Baby” something like that. Basically, we took the shampoo and we made these different hairstyles with my daughter using their shampoo. We had it nice and staged in the background and what not, but it was a way to get their brand into our video for almost the entire length of the video and very much centered around their products there. So you can kind of cater to the advertisers in that way and that’s great, a large part of your content is humor. Humor is hard if you’re not born with it, but it’s so incredibly effective though. 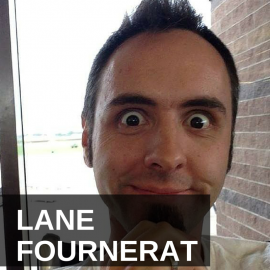 Do you have any tips for people, Lane, on using humor, creating humor, coming up with humorous ideas, anything there? Oh gosh, I wish I did. I guess I’m funny. *Laughter*. Well, the one with your kid is a great idea. I mean how do you think of that? The creative spark came to me. I really don’t have a way to express how that came to me. It just., “Oh yeah! What I used to do as a kid with shampoos. Oh! I made Mohawks. Let me try and film some funny hairstyles with her and then I can attach it to some celebrities.” That’s basically where it came from, I have no clue how that process came to be. It just kind of fell together that way. Right, right. Fantastic. Okay good. As far as the comedy, it’s just I think it’s a personality trait. I really do. Maybe, if you want to be more funny, start hanging out with funny people, I really don’t know. I’ve got a friend who’s a stand up comedian and maybe some of that rubbed off on me. You know? Could have. Definitely could have. So talk to us if you would, Lane, about equipment. This seems like a pretty easy part of the whole thing nowadays. It wasn’t that way just as recently as a few years ago, but the equipment part seems easy, but there’s probably a few tips there, right? Honestly, the equipment is the easiest and cheapest thing that it is right now. I do pretty much everything I do with a little Canon Power Shot camera that shoots HD video and I edit on a Mac Book Pro that’s 6 years old. I’m using iMovie. I probably should learn FinalCut, I just..I started learning on Adobe Premier back in the day, I would open Premier 6 and then I kinda ditched that because it was so much. I went into…I didn’t even have a Mac at that time, I was using Windows Movie Maker and then I realized, “Okay, if I’m doing this video thing, let me get a Mac Book, because I know those are good for video editing.” So I did that and I used iMovie ever since and I got FinalCutStudio, but I noticed that I never used it. Yeah, I’ve been using iMovie and it’s gotten the job done for me. It’s pretty good. I’m sure the next version of it will be a whole lot better. Do you use any lighting, microphones, anything like that? Why don’t you use an iPhone or a smartphone? Sure, sure. Lighting. I try and sit in front of a window. *Laughter*. If I’m not in front of a window, I turn on every light in the room that’s not behind me, because you don’t want to be back lit. That’s going to blow you out and it’s going to make a shadow on you, so that’s your tip there for lighting. Right, exactly. Audio. I use the microphone that’s inside the camera that I shoot with, which is a Canon ELPH 330, which I actually don’t think they make anymore. I actually have a nicer DSLR camera. It’s an Acorn E90, but I mainly use that for b-roll, whenever I want to get a closer up over something, because I don’t like the microphone that’s in it. If I wanted to upgrade my DSLR, I’d get probably a Canon, maybe TI4, because I think it has a microphone input and from the YouTubers do use that camera, I noticed there’s a RODE shotgun mic that works really well with it. Everybody likes that RODE mic. That’s about $220 shotgun mic. So how come you’re not just using a smartphone though? The smartphone! Yes, I knew that there was another question in there. First of all, I do have a third channel, it’s called LanesMobile and I shoot all those videos with my iPhone, but I noticed, one with the iPhone it’s usually a little shaky, because I go hand held with it a lot. The only time that I use my iPhone whenever I’m not doing, what I call, mobile phone videos, is whenever I have it sitting down some where and it’s going to be a very short video. Like, I have a video coming out this Friday. It’s a science experiment where I’m putting Styrofoam into acetone. The close up the dish where I’m putting the Styrofoam in, that is actually taken with my iPhone, because it’s already 1080p, so it’s great quality as far as what you’re getting there and the sound on it is going to be music, so it’s just a stationary shot of things I’m putting into this dish. It’s great for just that. There are accessories that you can get, I’ve seen, to get better audio quality through the headphone jack. I’ve just never really played around with any of those. It is possible to use your phone, I just think for standards, a separate camera for it, and another thing too is space. I find that I fill up my iPhone space a lot with everything else that I have on it. I want to try and edit video makes it a little tough. Curiously, we haven’t mentioned any other platforms, like Vimeo or any of the others out there, I liked to just ask you that. What are you plans for the future and what about any other platforms? Sure. First let’s talk about other platforms. I noticed YouTube dominant. YouTube is the main player. If you to Google.com, since YouTube is owed by Google, if you do a search, you’re more than likely going to get a YouTube video because they want to have their own products at the front of their search engine. So that’s why I’ve stuck with YouTube. It’s a lot of..There’s a lot of eyeballs there and I’m just trying to capitalize on those eyeballs. As far as where I’m going and where I want to go, I love making videos. It’s a passion of mine, it’s been there for, gosh, two decades now. Let’s see, a decade and half. I plan on keeping on doing video on YouTube Hopefully I can grow my audience more so I can reach out to more and more brands and bigger brands, so that I can do more of these brand deals. I really wanna grow my daily vlogging channel these days, which is YouTube.com/TheFunnyRats. It’s basically a documentation of my life. I shoot a 10 to 20 minute video every day and I upload it to YouTube. Just, “This is what we did today.” Because there’s still brands that are there. There’s people who are very interested in what other people’s lives are like I’ve noticed and to be able to put yourself out there with your own message, I think brands are starting to realize there is a lot of value in that, because it’s coming from such a personal level. What I would like to do, me and my wife have this dream, we want to sell everything we own, we want to buy an AirSteamTravel trailer and we want to travel around the country making YouTube videos and meeting up with other people, other people to collaborate with. We want to meet up with some of our fans and do meetups, we wanna be able to go to the different brands and actually sit down with them face-to-face to make the connections even stronger. Yeah, you wanna do high-tech, high-touch. That’s cool. Are you thinking of turning any of this into a longer form? When you’re talking about getting the AirStream and going around..
Basically, the idea of what I’m trying to do is I’m making these videos right now pretty much for free. You know, I get some money through ad-sense, but as far as sponsorships, I’m doing them for free until I get more sponsorships, but basically, I would want that company to me or I can go to them and let them know, “Hey, this is what I’m doing. I’ve got this many eyeballs, this many people are watching, this many people are subscribed, let’s work together.” That’s where I’d like to go with my brand. Yeah, good for you. Good for you. That’s cool. I’ll tell you something, Lane, I used to have a motor home and I really enjoyed that, I never used it when I didn’t have a girlfriend though. I had the motor home through two girlfriends and we went on all kinds of great trips. It was really fun, but what’s really going to change the game on this whole exploring the whole continent, the whole world really, is the self-driving car technology. I mean because if you can get in a motor home; you can’t do it on a trailer I’m sure, because it’ll be too unsafe; but a regular motor home like I had a Class A and just have it drive you places..wow, what an amazing thing. That would be just..
Just think if you could go to bed at night and wake up in a new spot every morning without you having to drive. That is my kind of life. That sounds like a really fun adventure. I love that idea. You know, if you’re documenting the whole thing and doing video out of it, I think that will be really interesting content for people, so good stuff. Give out your websites, tell people where they can find you, and learn about your work. Sure, the best place is YouTube.com/TheFunnyRats that’s the daily vlog and YouTube.com/Lanevid is my more, I guess you could say, show-like YouTube channel. Fantastic. Well, Lane, thanks so much for joining us today. Thank you for having me. I appreciate you having me on, this was very fun.